I started the two previous posts attempting to justify why we need all these mathematical formulas to understand stuff: because otherwise we just keep on repeating very simplistic but nonsensical things such as ‘matter behaves (sometimes) like light’, ‘light behaves (sometimes) like matter’ or, combining both, ‘light and matter behave like wavicles’. Indeed: what does ‘like‘ mean? Like the same but different? 🙂 However, I have not said much about light so far. Light and matter are two very different things. For matter, we have quantum mechanics. For light, we have quantum electrodynamics (QED). However, QED is not only a quantum theory about light: as Feynman pointed out in his little but exquisite 1985 book on quantum electrodynamics (QED: The Strange Theory of Light and Matter), it is first and foremost a theory about how light interacts with matter. However, let’s limit ourselves here to light. In classical physics, light is an electromagnetic wave: it just travels on and on and on because of that wonderful interaction between electric and magnetic fields. A changing electric field induces a magnetic field, the changing magnetic field then induces an electric field, and then the changing electric field induces a magnetic field, and… Well, you got the idea: it goes on and on and on. This wonderful machinery is summarized in Maxwell’s equations – and most beautifully so in the so-called Heaviside form of these equations, which assume a charge-free vacuum space (so there are no other charges lying around exerting a force on the electromagnetic wave or the (charged) particle whom’s behavior we want to study) and they also make abstraction of other complications such as electric currents (so there are no moving charges going around either). 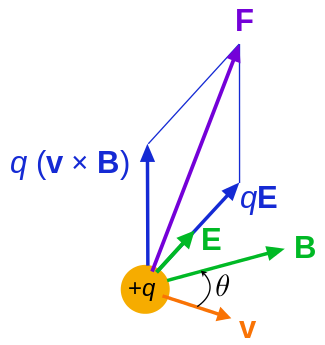 The electric and magnetic field E and B are represented by perpendicular oscillating vectors. The first and third equation (∇·E = 0 and ∇·B = 0) state that there are no static or moving charges around and, hence, they do not have any impact on (the flux of) E and B. The second and fourth equation are the ones that are essential. Note the time derivatives (∂/∂t): E and B oscillate and perpetuate each other by inducing new circulation of B and E.
The constants μ and ε in the fourth equation are the so-called permeability (μ) and permittivity (ε) of the medium, and μ0 and ε0 are the values for these constants in a vacuum space. Now, it is interesting to note that με equals 1/c2, so a changing electric field only produces a tiny change in the circulation of the magnetic field. That’s got something to do with magnetism being a ‘relativistic’ effect but I won’t explore that here – except for noting that the final Lorentz force on a (charged) particle F = q(E + v×B) will be the same regardless of the reference frame (moving or inertial): the reference frame will determine the mixture of E and B fields, but there is only one combined force on a charged particle in the end, regardless of the reference frame (inertial or moving at whatever speed – relativistic (i.e. close to c) or not). 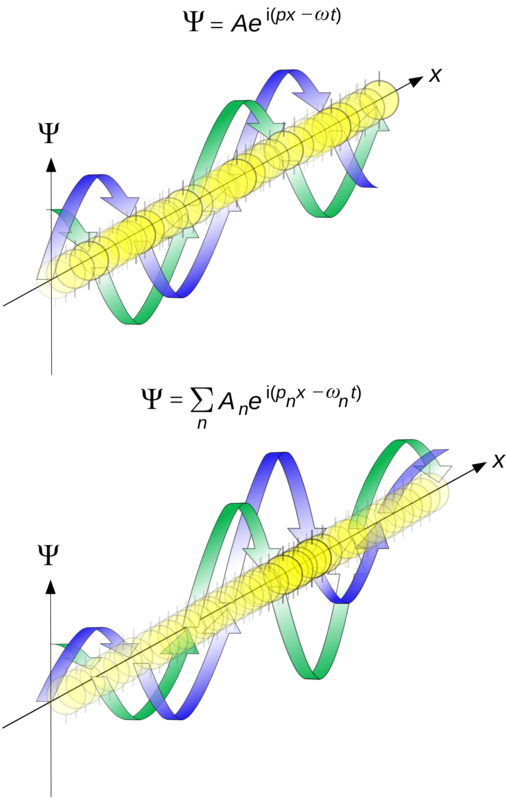 [The forces F, E and B on a moving (charged) particle are shown below the animation of the electromagnetic wave.] In other words, Maxwell’s equations are compatible with both special as well as general relativity. In fact, Einstein observed that these equations ensure that electromagnetic waves always travel at speed c (to use his own words: “Light is always propagated in empty space with a definite velocity c which is independent of the state of motion of the emitting body.”) and it’s this observation that led him to develop his special relativity theory. The other interesting thing to note is that there is energy in these oscillating fields and, hence, in the electromagnetic wave. Hence, if the wave hits an impenetrable barrier, such as a paper sheet, it exerts pressure on it – known as radiation pressure. [By the way, did you ever wonder why a light beam can travel through glass but not through paper? Check it out!] A very oft-quoted example is the following: if the effects of the sun’s radiation pressure on the Viking spacecraft had been ignored, the spacecraft would have missed its Mars orbit by about 15,000 kilometers. Another common example is more science fiction-oriented: the (theoretical) possibility of space ships using huge sails driven by sunlight (paper sails obviously – one should not use transparent plastic for that). Although photons are considered to have zero rest mass, they have energy and, hence, an equivalent relativistic mass (m = E/c2) and, therefore, also momentum. Indeed, energy and momentum are related through the following (relativistic) formula: E = (p2c2 + m02c4)1/2 (the non-relativistic version is simply E = p2/2m0 but – quite obviously – an approximation that cannot be used in this case – if only because the denominator would be zero). This simplifies to E = pc or p = E/c in this case. This basically says that the energy (E) and the momentum (p) of a photon are proportional, with c – the velocity of the wave – as the factor of proportionality. So, while the Planck relation (which goes back to 1905) obviously inspired Louis de Broglie (who introduced his theory on electron waves some 20 years later – in his PhD thesis of 1924 to be precise), their equations look the same but are different – and that’s probably the main reason why we keep two different symbols – f and ν – for the two frequencies. Electrons do not weigh much and, hence, can attain speeds close to light (but it requires tremendous amounts of energy to accelerate them very near c) but so they do have some mass, they have electric charge (photons are electrically neutral), and they are fermions – which means they’re an entirely different ‘beast’ so to say when it comes to combining their probability amplitudes (so that’s why they’ll never get together in some kind of electron laser beam either – just like protons or neutrons – as I explain in my post on Bose and Fermi indeed). Accelerating electric charges cause electromagnetic radiation (so moving charges (the negatively charged electrons) cause the electromagnetic field oscillations, but it’s the (neutral) photons that carry it). Electrons absorb and emit photons as they gain/lose energy when going from one energy level to the other. Most important of all, individual photons – just like electrons – also have a probability amplitude function – so that’s a de Broglie or matter wave function if you prefer that term. That means photons can also be described in terms of some kind of complex wave packet, just like that electron I kept analyzing in my previous posts – until I (and surely you) got tired of it. That means we’re presented with the same type of mathematics. For starters, we cannot be happy with assigning a unique frequency to our (complex-valued) de Broglie wave, because that would – once again – mean that we have no clue whatsoever where our photon actually is. So, while the shape of the wave function below might well describe the E and B of a bona fide electromagnetic wave, it cannot describe the (real or imaginary) part of the probability amplitude of the photons we would associate with that wave. The amplitude of a photon to be absorbed/emitted by an electron (a photon-electron coupling as it’s called). And then he needs only one more thing: the amplitude of an electron to go from point A to B. That’s all he needs to explain EVERYTHING – in quantum electrodynamics that is. So that’s partial reflection, diffraction, interference… Whatever! In Feynman’s own words: “Out of these three amplitudes, we can make the whole world, aside from what goes on in nuclei, and gravitation, as always!” So let’s have a look at it. I’ve shown some of his illustrations already in the Bose and Fermi post I mentioned above. In Feynman’s analysis, photons get emitted by some source and, as soon as they do, they travel with some stopwatch, as illustrated below. The speed with which the hand of the stopwatch turns is the angular frequency of the phase of the probability amplitude, and it’s length is the modulus -which, you’ll remember, we need to square to get a probability of something, so for the illustration below we have a probability of 0.2×0.2 = 4%. Probability of what? Relax. Let’s go step by step. Now, of course we do not know at what time the photon leaves the source and so the hand of the stopwatch could be at 2 o’clock, 9 o’clock or whatever: so the phase could be shifted by any value really. However, the thing to note is that the stopwatch’s hand goes around and around at a steady (angular) speed. That’s OK. We can’t know where the photon is because we’re obviously assuming a nice standardized light source emitting polarized light with a very specific color, i.e. all photons have the same frequency (so we don’t have to worry about spin and all that). Indeed, because we’re going to add and multiply amplitudes, we have to keep it simple (the complicated things should be left to clever people – or academics). 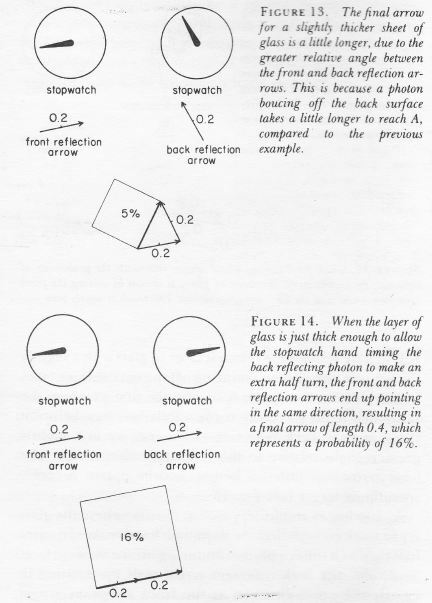 More importantly, it’s OK because we don’t need to know the exact position of the hand of the stopwatch as the photon leaves the source in order to explain phenomena like the partial reflection of light on glass. What matters there is only how much the stopwatch hand turns in the short time it takes to go from the front surface of the glass to its back surface. That difference in phase is independent from the position of the stopwatch hand as it reaches the glass: it only depends on the angular frequency (i.e. the energy of the photon, or the frequency of the light beam) and the thickness of the glass sheet. The two cases below present two possibilities: a 5% chance of reflection and a 16% chance of reflection (16% is actually a maximum, as Feynman shows in that little book, but that doesn’t matter here). But – Hey! – I am suddenly talking amplitudes for reflection here, and the probabilities that I am calculating (by adding amplitudes, not probabilities) are also (partial) reflection probabilities. Damn ! YOU ARE SMART! It’s true. But you get the idea, and I told you already that Feynman is not interested in the probability of a photon just being here or there or wherever. He’s interested in (1) the amplitude of it going from the source (i.e. some point A) to the glass surface (i.e. some other point B), and then (2) the amplitude of photon-electron couplings – which determine the above amplitudes for being reflected (i.e. being (back)scattered by an electron actually). So what? Well… Nothing. That’s it. I just wanted you to give some sense of de Broglie waves for photons. The thing to note is that they’re like de Broglie waves for electrons. So they are as real or unreal as these electron waves, and they have close to nothing to do with the electromagnetic wave of which they are part. The only thing that relates them with that real wave so to say, is their energy level, and so that determines their de Broglie wavelength. So, it’s strange to say, but we have two frequencies for a photon: E= hν and E = hf. The first one is the Planck relation (E= hν): it associates the energy of a photon with the frequency of the real-life electromagnetic wave. The second is the de Broglie relation (E = hf): once we’ve calculated the energy of a photon using E= hν, we associate a de Broglie wavelength with the photon. So we imagine it as a traveling stopwatch with angular frequency ω = 2πf. So that’s it (for now). End of story. Now, you may want to know something more about these other amplitudes (that’s what I would want), i.e. the amplitude of a photon to go from A to B and this coupling amplitude and whatever else that may or may not be relevant. Right you are: it’s fascinating stuff. For example, you may or may not be surprised that photons have an amplitude to travel faster or slower than light from A to B, and that they actually have many amplitudes to go from A to B: one for each possible path. [Does that mean that the path does not have to be straight? Yep. Light can take strange paths – and it’s the interplay (i.e. the interference) between all these amplitudes that determines the most probable path – which, fortunately (otherwise our amplitude theory would be worthless), turns out to be the straight line.] We can summarize this in a really short and nice formula for the P(A to B) amplitude [note that the ‘P’ stands for photon, not for probability – Feynman uses an E for the related amplitude for an electron, so he writes E(A to B)]. What could possibly have impacted the here and now (taking into account nothing can travel faster than light – even if we’ve mentioned some exceptions to this already, such as the phase velocity of a matter wave – but so that’s not a ‘signal’ and, hence, not in contradiction with relativity)? What could possible be impacted by the here and now (again taking into account that nothing can travel faster than c)? In short, the light cone defines the past, the here, and the future in spacetime in terms of (potential) causal relations. However, as this post has – once again – become too long already, I’ll need to write another post to discuss these other types of amplitudes – and how they are used in quantum electrodynamics. So my next post should probably say something about light-matter interaction, or on photons as the carriers of the electromagnetic force (both in light as well as in an atom – as it’s the electromagnetic force that keeps an electron in orbit around the (positively charged) nucleus). In case you wonder, yes, that’s Feynman diagrams – among other things. An illustration that shows how matter (a block of carbon of 1 cm thick in this case) looks like for an electromagnetic wave racing towards it. It does not look like Gruyère cheese, because Gruyère cheese is cheese with holes: matter is huge holes with just a tiny little bit of cheese ! Indeed, at the micro-level, matter looks like a lot of nothing with only a few tiny specks of matter sprinkled about! And so then he goes on to describe how ‘hard’ rays (i.e. rays with short wavelengths) just plow right through and so on and so on. Now it will probably sound very stupid to non-autodidacts but, for a very long time, I was vaguely intrigued that the amplitude of a wave doesn’t seem to matter when looking at the particle- versus wave-like character of electromagnetic waves. Electromagnetic waves are transverse waves so they oscillate up and down, perpendicular to the direction of travel (as opposed to longitudinal waves, such as sound waves or pressure waves for example: these oscillate back and forth – in the same direction of travel). And photon paths are represented by wiggly lines, so… Well, you may not believe it but that’s why I stupidly thought it’s the amplitude that should matter, not the wavelength. Indeed, the illustration below – which could be an example of how E or B oscillates in space and time – would suggest that lower amplitudes (smaller A’s) are the key to ‘avoiding’ those specks of matter. And if one can’t do anything about amplitude, then one may be forgiven to think that longer wavelengths – not shorter ones – are the key to avoiding those little ‘obstacles’ presented by atoms or nuclei in some crystal or non-crystalline structure. [Just jot it down: more wiggly lines increase the chance of hitting something.] But… Both lower amplitudes as well as longer wavelengths imply less energy. Indeed, the energy of a wave is, in general, proportional to the square of its amplitude and electromagnetic waves are no exception in this regard. As for wavelength, we have Planck’s relation. So what’s wrong in my very childish reasoning? As usual, the answer is easy for those who already know it: neither wavelength nor amplitude have anything to do with how much space this wave actually takes as it propagates. But of course! You didn’t know that? Well… Sorry. Now I do. The vertical y axis might measure E and B indeed, but the graph and the nice animation above should not make you think that these field vectors actually occupy some space. So you can think of electromagnetic waves as particle waves indeed: we’ve got ‘something’ that’s traveling in a straight line, and it’s traveling at the speed of light. That ‘something’ is a photon, and it can have high or low energy. If it’s low-energy, it’s like a speck of dust: even if it travels at the speed of light, it is easy to deflect (i.e. scatter), and the ’empty space’ in matter (which is, of course, not empty but full of all kinds of electromagnetic disturbances) may well feel like jelly to it: it will get stuck (read: it will be absorbed somewhere or not even get through the first layer of atoms at all). If it’s high-energy, then it’s a different story: then the photon is like a tiny but very powerful bullet – same size as the speck of dust, and same speed, but much and much heavier. Such ‘bullet’ (e.g. a gamma ray photon) will indeed have a tendency to plow through matter like it’s air: it won’t care about all these low-energy fields in it. It is, most probably, a very trivial point to make, but I thought it’s worth doing so. After all those boring pieces on math, it is about time I got back to physics. Indeed, what’s all that stuff on differential equations and complex numbers good for? This blog was supposed to be a journey into physics, wasn’t it? Yes. But wave functions – functions describing physical waves (in classical mechanics) or probability amplitudes (in quantum mechanics) – are the solution to some differential equation, and they will usually involve complex-number notation. However, I agree we have had enough of that now. Let’s see how it works. By the way, the title of this post – An Easy Piece – is an obvious reference to (some of) Feynman’s 1965 Lectures on Physics, some of which were re-packaged in 1994 (six years after his death that is) in ‘Six Easy Pieces’ indeed – but, IMHO, it makes more sense to read all of them as part of the whole series. Let’s first look at one of the most used mathematical shapes: the sinusoidal wave. The illustration below shows the basic concepts: we have a wave here – some kind of cyclic thing – with a wavelength λ, an amplitude (or height) of (maximum) A0, and a so-called phase shift equal to φ. The Wikipedia definition of a wave is the following: “a wave is a disturbance or oscillation that travels through space and matter, accompanied by a transfer of energy.” Indeed, a wave transports energy as it travels (oh – I forgot to mention the speed or velocity of a wave (v) as an important characteristic of a wave), and the energy it carries is directly proportional to the square of the amplitude of the wave: E ∝ A2 (this is true not only for waves like water waves, but also for electromagnetic waves, like light). Let’s now look at how these variables get into the argument – literally: into the argument of the wave function. Let’s start with that phase shift. The phase shift is usually defined referring to some other wave or reference point (in this case the origin of the x and y axis). Indeed, the amplitude – or ‘height’ if you want (think of a water wave, or the strength of the electric field) – of the wave above depends on (1) the time t (not shown above) and (2) the location (x), but so we will need to have this phase shift φ in the argument of the wave function because at x = 0 we do not have a zero height for the wave. So, as we can see, we can shift the x-axis left or right with this φ. OK. That’s simple enough. Let’s look at the other independent variables now: time and position. The height (or amplitude) of the wave will obviously vary both in time as well as in space. On this graph, we fixed time (t = 0) – and so it does not appear as a variable on the graph – and show how the amplitude y = A varies in space (i.e. along the x-axis). We could also have looked at one location only (x = 0 or x1 or whatever other location) and shown how the amplitude varies over time at that location only. The graph would be very similar, except that we would have a ‘time distance’ between two crests (or between two troughs or between any other two points separated by a full cycle of the wave) instead of the wavelength λ (i.e. a distance in space). This ‘time distance’ is the time needed to complete one cycle and is referred to as the period of the wave (usually denoted by the symbol T or T0 – in line with the notation for the maximum amplitude A0). In other words, we will also see time (t) as well as location (x) in the argument of this cosine or sine wave function. By the way, it is worth noting that it does not matter if we use a sine or cosine function because we can go from one to the other using the basic trigonometric identities cos θ = sin(π/2 – θ) and sin θ = cos(π/2 – θ). So all waves of the shape above are referred to as sinusoidal waves even if, in most cases, the convention is to actually use the cosine function to represent them. So we will have x, t and φ in the argument of the wave function. Hence, we can write A = A(x, t, φ) = cos(x + t + φ) and there we are, right? Well… No. We’re adding very different units here: time is measured in seconds, distance in meter, and the phase shift is measured in radians (i.e. the unit of choice for angles). So we can’t just add them up. The argument of a trigonometric function (like this cosine function) is an angle and, hence, we need to get everything in radians – because that’s the unit we use to measure angles. So how do we do that? Let’s do it step by step. Does this sound fishy? It shouldn’t. Think about it. In the (electric) field equation for electromagnetic radiation (that’s one of the examples of a wave which I mentioned above), you’ll find the so-called retarded acceleration a(t – x/c) in the argument: that’s the acceleration (a)of the charge causing the electric field at point x to change not at time t but at time t – x/c. So that’s the retarded acceleration indeed: x/c is the time it took for the wave to travel from its origin (the oscillating point charge) to x and so we subtract that from t. [When talking electromagnetic radiation (e.g. light), the wave velocity v is obviously equal to c, i.e. the speed of light, or of electromagnetic radiation in general.] Of course, you will now object that t – x/c is not the same as vt – x, and you are right: we need time units in the argument of that acceleration function, not distance. We can get to distance units if we would multiply the time with the wave velocity v but that’s complicated business because the velocity of that moving point charge is not a constant. […] I am not sure if I made myself clear here. If not, so be it. The thing to remember is that we need an input expressed in radians for our cosine function, not time, nor distance. Indeed, the argument in a sine or cosine function is an angle, not some distance. We will call that angle the phase of the wave, and it is usually denoted by the symbol θ – which we also used above. But so far we have been talking about amplitude as a function of distance, and we expressed time in distance units too – by multiplying it with v. How can we go from some distance to some angle? It is simple: we’ll multiply x – vt with 2π/λ. We could also write A = A0cosθ with θ = (2π/λ)(x-vt). […] Both representations look rather ugly, don’t they? They do. And it’s not only ugly: it’s not the standard representation of a sinusoidal wave either. In order to make it look ‘nice’, we have to introduce some more concepts here, notably the angular frequency and the wave number. So let’s do that. The angular frequency is just like the… well… the frequency you’re used to, i.e. the ‘non-angular’ frequency f, as measured in cycles per second (i.e. in Hertz). However, instead of measuring change in cycles per second, the angular frequency (usually denoted by the symbol ω) will measure the rate of change of the phase with time, so we can write or define ω as ω = ∂θ/∂t. In this case, we can easily see that ω = –2πv/λ. [Note that we’ll take the absolute value of that derivative because we want to work with positive numbers for such properties of functions.] Does that look complicated? In doubt, just remember that ω is measured in radians per second and then you can probably better imagine what it is really. Another way to understand ω somewhat better is to remember that the product of ω and the period T is equal to 2π, so that’s a full cycle. Indeed, the time needed to complete one cycle multiplied with the phase change per second (i.e. 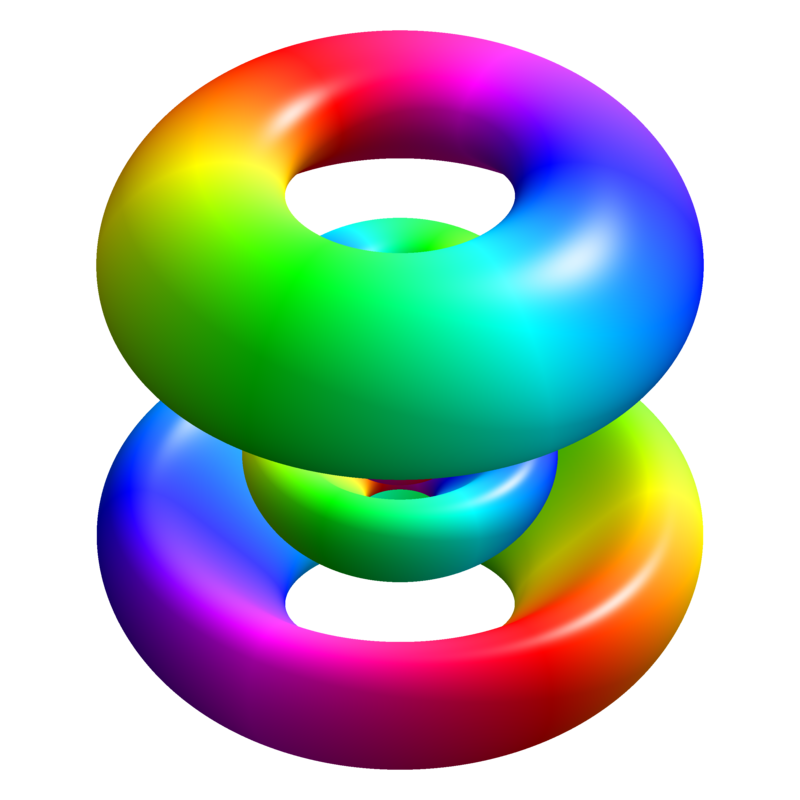 per unit time) is equivalent to going round the full circle: 2π = ω.T. Because f = 1/T, we can also relate ω to f and write ω = 2π.f = 2π/T. Likewise, we can measure the rate of change of the phase with distance, and that gives us the wave number k = ∂θ/∂x, which is like the spatial frequency of the wave. So it is just like the wavelength but then measured in radians per unit distance. From the function above, it is easy to see that k = 2π/λ. The interpretation of this equality is similar to the ω.T = 2π equality. Indeed, we have a similar equation for k: 2π = k.λ, so the wavelength (λ) is for k what the period (T) is for ω. If you’re still uncomfortable with it, just play a bit with some numerical examples and you’ll be fine. You will agree that this looks much ‘nicer’ – and also more in line with what you’ll find in textbooks or on Wikipedia. 🙂 I should note, however, that we’re not adding any new parameters here. The wave number k and the angular frequency ω are not independent: this is still the same wave (A = A0cos[(2π/λ)(x-vt)]), and so we are not introducing anything more than the frequency and – equally important – the speed with which the wave travels, which is usually referred to as the phase velocity. In fact, it is quite obvious from the ω.T = 2π and the k = 2π/λ identities that kλ = ω.T and, hence, taking into account that λ is obviously equal to λ = v.T (the wavelength is – by definition – the distance traveled by the wave in one period), we find that the phase (or wave) velocity v is equal to the ratio of ω and k, so we have that v = ω/k. So x, t, ω and k could be re-scaled or so but their ratio cannot change: the velocity of the wave is what it is. In short, I am introducing two new concepts and symbols (ω and k) but there are no new degrees of freedom in the system so to speak. With the rather lengthy ‘introduction’ to waves above, we are now ready for the thing I really wanted to present here. I will go much faster now that we have covered the basics. Let’s go. From my previous posts on complex numbers (or from what you know on complex numbers already), you will understand that working with cosine functions is much easier when writing them as the real part of a complex number A0eiθ = A0ei(kx – ωt + φ). Indeed, A0eiθ = A0(cosθ + isinθ) and so the cosine function above is nothing else but the real part of the complex number A0eiθ. Working with complex numbers makes adding waves and calculating interference effects and whatever we want to do with these wave functions much easier: we just replace the cosine functions by complex numbers in all of the formulae, solve them (algebra with complex numbers is very straightforward), and then we look at the real part of the solution to see what is happening really. We don’t care about the imaginary part, because that has no relationship to the actual physical quantities – for physical and electromagnetic waves that is, or for any other problem in classical wave mechanics. Done. So, in classical mechanics, the use of complex numbers is just a mathematical tool. Now, that is not the case for the wave functions in quantum mechanics: the imaginary part of a wave equation – yes, let me write one down here – such as Ψ = Ψ(x, t) = (1/x)ei(kx – ωt) is very much part and parcel of the so-called probability amplitude that describes the state of the system here. In fact, this Ψ function is an example taken from one of Feynman’s first Lectures on Quantum Mechanics (i.e. Volume III of his Lectures) and, in this case, Ψ(x, t) = (1/x)ei(kx – ωt) represents the probability amplitude of a tiny particle (e.g. an electron) moving freely through space – i.e. without any external forces acting upon it – to go from 0 to x and actually be at point x at time t. [Note how it varies inversely with the distance because of the 1/x factor, so that makes sense.] In fact, when I started writing this post, my objective was to present this example – because it illustrates the concept of the wave function in quantum mechanics in a fairly easy and relatively understandable way. So let’s have a go at it. I agree this looks somewhat ugly again, but so what does it say? First, be aware of the difference between bold and normal type: I am writing p and v in bold type above because they are vectors: they have a magnitude (which I will denote by p and v respectively) as well as a direction in space. Likewise, r12 is a vector going from r1 to r2 (and r1 and r2 themselves are space vectors themselves obviously) and so r12 (non-bold) is the magnitude of that vector. Keeping that in mind, we know that the dot product p.r12 is equal to the product of the magnitudes of those vectors multiplied by cosα, with α the angle between those two vectors. Hence, p.r12 .= p.r12.cosα. Now, if p and r12 have the same direction, the angle α will be zero and so cosα will be equal to one and so we just have p.r12 = p.r12 or, if we’re considering a particle going from 0 to some position x, p.r12 = p.r12 = px. Now we also have Planck’s constant there, in its reduced form ħ = h/2π. 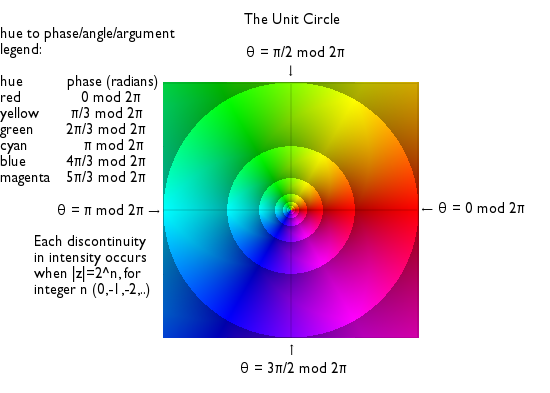 As you can imagine, this 2π has something to do with the fact that we need radians in the argument. It’s the same as what we did with x in the argument of that cosine function above: if we have to express stuff in radians, then we have to absorb a factor of 2π in that constant. However, here I need to make an additional digression. Planck’s constant is obviously not just any constant: it is the so-called quantum of action. Indeed, it appears in what may well the most fundamental relations in physics. The first of these fundamental relations is the so-called Planck relation: E = hf. The Planck relation expresses the wave-particle duality of light (or electromagnetic waves in general): light comes in discrete quanta of energy (photons), and the energy of these ‘wave particles’ is directly proportional to the frequency of the wave, and the factor of proportionality is Planck’s constant. The second fundamental relation, or relations – in plural – I should say, are the de Broglie relations. Indeed, Louis-Victor-Pierre-Raymond, 7th duc de Broglie, turned the above on its head: if the fundamental nature of light is (also) particle-like, then the fundamental nature of particles must (also) be wave-like. So he boldly associated a frequency f and a wavelength λ with all particles, such as electrons for example – but larger-scale objects, such as billiard balls, or planets, also have a de Broglie wavelength and frequency! The de Broglie relation determining the de Broglie frequency is – quite simply – the re-arranged Planck relation: f = E/h. So this relation relates the de Broglie frequency with energy. However, in the above wave function, we’ve got momentum, not energy. Well… Energy and momentum are obviously related, and so we have a second de Broglie relation relating momentum with wavelength: λ = h/p. We’re almost there: just hang in there. 🙂 When we presented the sinusoidal wave equation, we introduced the angular frequency (ω) and the wave number (k), instead of working with f and λ. That’s because we want an argument expressed in radians. Here it’s the same. 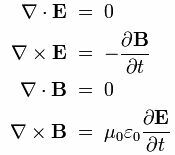 The two de Broglie equations have a equivalent using angular frequency and wave number: ω = E/ħ and k = p/ħ. So we’ll just use the second one (i.e. the relation with the momentum in it) to associate a wave number with the particle (k = p/ħ). We’ve got the math – I hope. But what does this equation mean really? What’s that de Broglie wavelength or frequency in reality? What wave are we talking about? Well… What’s reality? As mentioned above, the famous de Broglie relations associate a wavelength λ and a frequency f to a particle with momentum p and energy E, but it’s important to mention that the associated de Broglie wave function yields probability amplitudes. So it is, indeed, not a ‘real wave in space’ as Feynman would put it. It is a quantum-mechanical wave equation. Huh? […] It’s obviously about time I add some illustrations here, and so that’s what I’ll do. Look at the two cases below. The case on top is pretty close to the situation I described above: it’s a de Broglie wave – so that’s a complex wave – traveling through space (in one dimension only here). The real part of the complex amplitude is in blue, and the green is the imaginary part. So the probability of finding that particle at some position x is the modulus squared of this complex amplitude. Now, this particular wave function ignores the 1/x variation and, hence, the squared modulus of Aei(kx – ωt) is equal to a constant. To be precise, it’s equal to A2 (check it: the squared modulus of a complex number z equals the product of z and its complex conjugate, and so we get A2 as a result indeed). So what does this mean? It means that the probability of finding that particle (an electron, for example) is the same at all points! In other words, we don’t know where it is! In the illustration below (top part), that’s shown as the (yellow) color opacity: the probability is spread out, just like the wave itself, so there is no definite position of the particle indeed. By now, I must assume you shook your head in disbelief a couple of time already. Surely, this particle (let’s stick to the example of an electron) must be somewhere, yes? Of course. […] That’s enough on this I guess, but let me – as a way to conclude this little digression – just quickly state the Uncertainty Principle in a more or less accurate version here, rather than all of the ‘descriptions’ which you may have seen of it: the Uncertainty Principle refers to any of a variety of mathematical inequalities asserting a fundamental limit (fundamental means it’s got nothing to do with observer or measurement effects, or with the limitations of our experimental technologies) to the precision with which certain pairs of physical properties of a particle (these pairs are known as complementary variables) such as, for example, position (x) and momentum (p), can be known simultaneously. More in particular, for position and momentum, we have that σxσp ≥ ħ/2 (and, in this formulation, σ is, obviously the standard symbol for the standard deviation of our point estimate for x and p respectively). OK. Back to the illustration above. A particle that is to be found in some specific region – rather than just ‘somewhere’ in space – will have a probability amplitude resembling the wave equation in the bottom half: it’s a wave train, or a wave packet, and we can decompose it, using the Fourier analysis, in a number of sinusoidal waves, but so we do not have a unique wavelength for the wave train as a whole, and that means – as per the de Broglie equations – that there’s some uncertainty about its momentum (or its energy). I will let this sink in for now. In my next post, I will write some more about these wave equations. They are usually a solution to some differential equation – and that’s where my next post will connect with my previous ones (on differential equations). Just to say goodbye – as for now that is – I will just copy another beautiful illustration from Wikipedia. See below: it represents the (likely) space in which a single electron on the 5d atomic orbital of a hydrogen atom would be found. The solid body shows the places where the electron’s probability density (so that’s the squared modulus of the probability amplitude) is above a certain value – so it’s basically the area where the likelihood of finding the electron is higher than elsewhere. The hue on the colored surface shows the complex phase of the wave function. The de Broglie relations are a wonderful pair. They’re obviously equivalent: energy and momentum are related, and wavelength and frequency are obviously related too through the general formula relating frequency, wavelength and wave velocity: fλ = v (the product of the frequency and the wavelength must yield the wave velocity indeed). However, when it comes to the relation between energy and momentum, there is a little catch. What kind of energy are we talking about? We were describing a free particle (e.g. an electron) traveling through space, but with no (other) charges acting on it – in other words: no potential acting upon it), and so we might be tempted to conclude that we’re talking about the kinetic energy (K.E.) here. So, at relatively low speeds (v), we could be tempted to use the equations p = mv and K.E. = p2/2m = mv2/2 (the one electron in a hydrogen atom travels at less than 1% of the speed of light, and so that’s a non-relativistic speed indeed) and try to go from one equation to the other with these simple formulas. Well… Let’s try it. f = E/h according to de Broglie and, hence, substituting E with p2/2m and f with v/λ, we get v/λ = m2v2/2mh. Some simplification and re-arrangement should then yield the second de Broglie relation: λ = 2h/mv = 2h/p. So there we are. Well… No. The second de Broglie relation is just λ = h/p: there is no factor 2 in it. So what’s wrong? The problem is the energy equation: de Broglie does not use the K.E. formula. [By the way, you should note that the K.E. = mv2/2 equation is only an approximation for low speeds – low compared to c that is.] He takes Einstein’s famous E = mc2 equation (which I am tempted to explain now but I won’t) and just substitutes c, the speed of light, with v, the velocity of the slow-moving particle. This is a very fine but also very deep point which, frankly, I do not yet fully understand. Indeed, Einstein’s E = mc2 is obviously something much ‘deeper’ than the formula for kinetic energy. The latter has to do with forces acting on masses and, hence, obeys Newton’s laws – so it’s rather familiar stuff. As for Einstein’s formula, well… That’s a result from relativity theory and, as such, something that is much more difficult to explain. While the difference between the two energy formulas is just a factor of 1/2 (which is usually not a big problem when you’re just fiddling with formulas like this), it makes a big conceptual difference. In these equations, the Planck constant (be it h or ħ) appears as a simple factor of proportionality (we will worry about what h actually is in physics in later posts) – but a very tiny one: approximately 6.626×10–34 J·s (Joule is the standard SI unit to measure energy, or work: 1 J = 1 kg·m2/s2), or 4.136×10–15 eV·s when using a more appropriate (i.e. larger) measure of energy for atomic physics: still, 10–15 is only 0.000 000 000 000 001. So how does it work? First note, once again, that we are supposed to use the equivalent for slow-moving particles of Einstein’s famous E = mc2 equation as a measure of the energy of a particle: E = mv2. We know velocity adds mass to a particle – with mass being a measure for inertia. In fact, the mass of so-called massless particles, like photons, is nothing but their energy (divided by c2). In other words, they do not have a rest mass, but they do have a relativistic mass m = E/c2, with E = hf (and with f the frequency of the light wave here). Particles, such as electrons, or protons, do have a rest mass, but then they don’t travel at the speed of light. So how does that work out in that E = mv2 formula which – let me emphasize this point once again – is not the standard formula (for kinetic energy) that we’re used to (i.e. E = mv2/2)? Let’s do the exercise. For photons, we can re-write E = hf as E = hc/λ. The numerator hc in this expression is 4.136×10–15 eV·s (i.e. the value of the Planck constant h expressed in eV·s) multiplied with 2.998×108 m/s (i.e. the speed of light c) so that’s (more or less) hc ≈ 1.24×10–6 eV·m. For visible light, the denominator will range from 0.38 to 0.75 micrometer (1 μm = 10–6 m), i.e. 380 to 750 nanometer (1 nm = 10–6 m), and, hence, the energy of the photon will be in the range of 3.263 eV to 1.653 eV. So that’s only a few electronvolt (an electronvolt (eV) is, by definition, the amount of energy gained (or lost) by a single electron as it moves across an electric potential difference of one volt). So that’s 2.6 to 5.2 Joule (1 eV = 1.6×10–19 Joule) and, hence, the equivalent relativistic mass of these photons is E/c2 or 2.9 to 5.8×10–34 kg. That’s tiny – but not insignificant. Indeed, let’s look at an electron now. The rest mass of an electron is about 9.1×10−31 kg (so that’s a scale factor of a thousand as compared to the values we found for the relativistic mass of photons). Also, in a hydrogen atom, it is expected to speed around the nucleus with a velocity of about 2.2×106 m/s. That’s less than 1% of the speed of light but still quite fast obviously: at this speed (2,200 km per second), it could travel around the earth in less than 20 seconds (a photon does better: it travels not less than 7.5 times around the earth in one second). In any case, the electron’s energy – according to the formula to be used as input for calculating the de Broglie frequency – is 9.1×10−31 kg multiplied with the square of 2.2×106 m/s, and so that’s about 44×10–19 Joule or about 70 eV (1 eV = 1.6×10–19 Joule). So that’s – roughly – 35 times more than the energy associated with a photon. The frequency we should associate with 70 eV can be calculated from E = hv/λ (we should, once again, use v instead of c), but we can also simplify and calculate directly from the mass: λ = hv/E = hv/mv2 = h/mv (however, make sure you express h in J·s in this case): we get a value for λ equal to 0.33 nanometer, so that’s more than one thousand times shorter than the above-mentioned wavelengths for visible light. So, once again, we have a scale factor of about a thousand here. That’s reasonable, no? [There is a similar scale factor when moving to the next level: the mass of protons and neutrons is about 2000 times the mass of an electron.] Indeed, note that we would get a value of 0.510 MeV if we would apply the E = mc2, equation to the above-mentioned (rest) mass of the electron (in kg): MeV stands for mega-electronvolt, so 0.510 MeV is 510,000 eV. So that’s a few hundred thousand times the energy of a photon and, hence, it is obvious that we are not using the energy equivalent of an electron’s rest mass when using de Broglie’s equations. No. It’s just that simple but rather mysterious E = mv2 formula. So it’s not mc2 nor mv2/2 (kinetic energy). Food for thought, isn’t it? Let’s look at the formulas once again. Again, this is serious food for thought: I have not seen any ‘easy’ explanation of this relation so far. To appreciate its peculiarity, just compare it to the usual relations relating energy and momentum: E =p2/2m or, in its relativistic form, p2c2 = E2 – m02c4 . So these two equations are both not to be used when going from one de Broglie relation to another. [Of course, it works for massless photons: using the relativistic form, we get p2c2 = E2 – 0 or E = pc, and the de Broglie relation becomes the Planck relation: E = hf (with f the frequency of the photon, i.e. the light beam it is part of). We also have p = h/λ = hf/c, and, hence, the E/p = c comes naturally. But that’s not the case for (slower-moving) particles with some rest mass: why should we use mv2 as a energy measure for them, rather than the kinetic energy formula? But let’s just accept this weirdness and move on. After all, perhaps there is some mistake here and so, perhaps, we should just accept that factor 2 and replace λ = h/p by λ = 2h/p. Why not? 🙂 In any case, both the λ = h/mv and λ = 2h/p = 2h/mv expressions give the impression that both the mass of a particle as well as its velocity are on a par so to say when it comes to determining the numerical value of the de Broglie wavelength: if we double the speed, or the mass, the wavelength gets shortened by half. So, one would think that larger masses can only be associated with extremely short de Broglie wavelengths if they move at a fairly considerable speed. But that’s where the extremely small value of h changes the arithmetic we would expect to see. Indeed, things work different at the quantum scale, and it’s the tiny value of h that is at the core of this. Indeed, it’s often referred to as the ‘smallest constant’ in physics, and so here’s the place where we should probably say a bit more about what h really stands for. But let’s get back to the de Broglie wavelength now. As mentioned above, one would think that larger masses can only be associated with extremely short de Broglie wavelengths if they move at a fairly considerable speed. Well… It turns out that the extremely small value of h upsets our everyday arithmetic. Indeed, because of the extremely small value of h as compared to the objects we are used to ( in one grain of salt alone, we will find about 1.2×1018 atoms – just write a 1 with 18 zeroes behind and you’ll appreciate this immense numbers somewhat more), it turns out that speed does not matter all that much – at least not in the range we are used to. For example, the de Broglie wavelength associated with a baseball weighing 145 grams and traveling at 90 mph (i.e. approximately 40 m/s) would be 1.1×10–34 m. That’s immeasurably small indeed – literally immeasurably small: not only technically but also theoretically because, at this scale (i.e. the so-called Planck scale), the concepts of size and distance break down as a result of the Uncertainty Principle. But, surely, you’ll think we can improve on this if we’d just be looking at a baseball traveling much slower. Well… It does not much get better for a baseball traveling at a snail’s pace – let’s say 1 cm per hour, i.e. 2.7×10–6 m/s. Indeed, we get a wavelength of 17×10–28 m, which is still nowhere near the nanometer range we found for electrons. Just to give an idea: the resolving power of the best electron microscope is about 50 picometer (1 pm = ×10–12 m) and so that’s the size of a small atom (the size of an atom ranges between 30 and 300 pm). In short, for all practical purposes, the de Broglie wavelength of the objects we are used to does not matter – and then I mean it does not matter at all. And so that’s why quantum-mechanical phenomena are only relevant at the atomic scale.